Blockchain is a cryptocurrency system in which a record of transactions are maintained within an encrypted database across a linked network. Blockchain can be seen as a database in which every participant has a replicated copy of information. In daily life, we deal a lot with databases. Think of your bank account, your medical details, or an overview of your frequent flyer miles for example. The difference with blockchain is that with the examples mentioned, there is only one person who has full control over the data, also referred to as centralized management. In the blockchain, each participant has an exact copy of all data stored within the blockchain. Each participant can contribute data, but old data cannot be adjusted. This feature ensures that not one single entity has control over the data and it makes the blockchain decentralized. How is data currently stored? To be able to explain in which areas blockchain can really make an impact, it is important to first understand how the world currently deals with data. At the moment, data is often stored and managed by one or more parties. Take for example: your bank or PayPal account. Every day, money comes in or goes out. The entire database with all transfers to and from the bank is called a ‘ledger’. All these amounts will be debited or credited by the institution where you hold your account. The party we must fully rely on is therefore the bank or another payment service. Another example where it immediately becomes clear that the current way of storing data sometimes falls short is car repairs. Whereas you can assume that your bank will not just make 10,000 euros disappear from your account, you can not always assume that the mileage shown is correct when buying a used car. The so-called ‘ledger’ in this case is the maintenance booklet of the specific car. A contract recorded in the blockchain is also called a smart contract. At the moment buying a house requires a lot of work for example. Numerous contracts and agreements have to be drawn up and signed. In the future, this process will become a lot easier with the blockchain. In addition to contracts, you can apply the blockchain technique in many other sectors. The most obvious example is money of course. Since the 2008 economic crisis, many people have become more suspicious of the financial system. In the west, you can already notice this, but in other parts of the world, this distrust towards financial institutions and governments (think of the hyperinflation in Venezuela) is even much greater. Digital currency on the blockchain is not controlled by anyone and therefore, cannot be controlled by an institution (excluding exchange rate fluctuations). In many countries, digital currencies can therefore become a good alternative to traditional money. Both examples of blockchain sectors can be applied to and be traced back with confidence. Wherever trust is involved, the blockchain can be applied. This ranges from checking which ingredients are in your medicines to consuming energy. Below, we will further explain the two most commonly used protocols: Proof of Work (POW) and Proof of Stake (POS). The ‘Proof of Work’ protocol can best be explained when we think of the database where each participant has a replicated copy and where also, each participant can contribute. All data or transactions added to the database by a participant must be checked on accuracy. Without approving the data or transactions, the blockchain could not exist, because the database would become no longer accurate. Validating whether a transaction does not conflict with the database is done through an algorithm. Every change to the blockchain must be validated again. When a transaction is made, it is almost immediately informed in the blockchain network. The transaction first ends up in a so-called ‘mempool’, this is a kind of reservoir in which all transactions that have not yet been processed are stored. In general, the transactions with the highest transaction fee are the first to be included in the next block. This is called a confirmation. For transactions with a very low fee, it can take a long time to be confirmed in the blockchain. For Bitcoin, only a limited number of transactions can be included in each block. A block is created by calculating a mathematical puzzle, the so-called ‘nonce’. This is done by fast computers, which in the cryptocurrency world are called ‘miners’. As soon as a miner has solved the mathematical puzzle, the transactions in the block are added to the blockchain. This makes the transaction final and permanent. This can never be changed again. The miner is rewarded with 12.5 bitcoin and the ‘fees’ linked to each transaction in that block. The more people or companies that decide to go mining, the more difficult, and therefore, more energy intensive it becomes to solve the mathematical calculation. The amount of minutes which it takes to generate a new block is predetermined. For Bitcoin, this occurs every ten minutes. The more miners there are, the greater the degree of difficulty. This ensures that the average time it will take for a new block to be generated remains a minimum of ten minutes. It also works the other way around. The complexity decreases when there are fewer miners. Due to energy intensive process the protocol is being increasingly criticised. 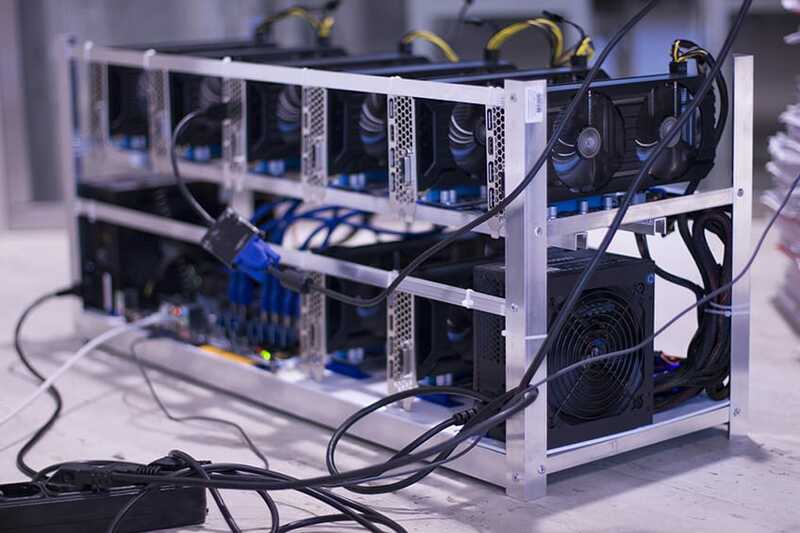 With ‘Proof of Stake’, no computer power is used to mine a block. Participants in a Proof of Stake blockchain are rewarded if they open their assets (stake) to the blockchain. With a Proof of Stake coin, you have to leave your wallet open as it was to have a chance to win a reward. Proof of stake is a kind of lottery. The more coins you have, the greater the chance of a reward. As soon as a transaction takes place, a reward is raffled among the participants, who support the blockchain. Suppose you have 5% of the total number of coins, then you have a 5% chance of getting the reward every time. Currently there are multiple variants of the Proof of Stake protocol. The most commonly used type after Proof of Stake is called ‘Delegated Proof of Stake’ (DPOS). With Delegated Proof of Stake you don’t have to leave your computer turned on, so you can leave your portfolio open. With this protocol, you vote for a delegate. This delegate uses your stake and the stake of others to win proof of stake rewards. These rewards are then distributed pro rata to everyone who voted for the delegate.